Autism is easy to misunderstand, misinterpret, and mislead. My son is the master of disguise, and the best way to understand our kids is to assume nothing. That is, assume only that they are kids, children, teens—silly, loving, intelligent—and, well, simply put, no different than any other kid. Everything I have been told about autism is wrong. Everything I know about autism I have learned from my son with autism. He loves me just like his typical siblings love me, he cries when he misses me, and he smiles when we are together again. He cannot speak. He has never been able to express his favorite color, or cartoon, or game. My heart longs to know him, to know the little everyday things: to know that he has favorites; to know that he likes the food I serve him; to know if he is happy; and to know that he loves me. But he finds a way. Always adapting, my son finds a way to let me know what is on his mind and surprises me with his creative way of reaching me. Now it is my job to reach others. I must interpret for the world what my son is telling me. He speaks to me with his eyes. In a single look, I can tell what he is thinking: I know when he is hungry, when he has a migraine, when he wants to take a bath, and when he wants a hug. 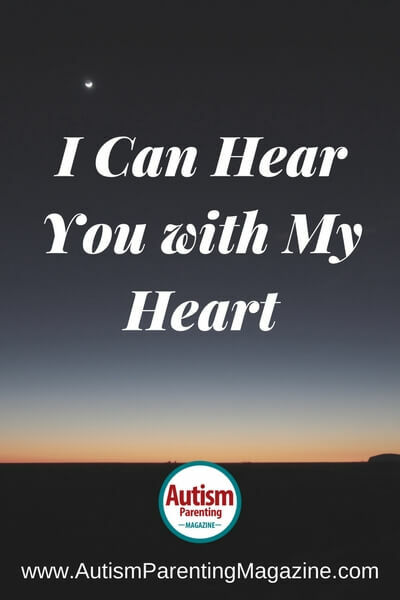 My letter to my nonverbal son: I Can Hear You With My Heart. I can hear you with my heart. I listen with my eyes because you speak to me with your soul. A glance from you tells me what you need: your requests for food, attention, hugs, if you are in pain, sad, or depressed. All of your inner thoughts become mine through a bond we forged while you were still growing inside me—a bond that has strengthened and evolved due to necessity. For your survival, we must grow closer. I must be on high alert at all times: ready to feed you when hungry, hug you when you are sad, play a game with you when no one else knows you want to interact. As you sit there in silence, I must know what message you are sending me. “Mommy, I am lonely,” your eyes tell me. So, I color with you. “Mommy, I am in pain,” your eyes tell me. So I hug you, but my hugs are not strong enough. You want squeezes and deep pressure. You seek what you need, as we all do. All people have desires and needs, you are no different. You squeeze me and I look into your eyes and say, “Ouch! Too hard!” but I know what you are telling me. You are no different than any other teen: the puberty, the hormones, the temperament. I think of your older brother and his daily needs, and how his needs are being met, and yours are not. I think of your brother at school, talking to pretty girls and laughing. While you notice pretty girls, all you can do is smile and blush. I think of your brother and how he plays football at school. He and the other boys running, hitting, yelling, and laughing. You have the same need to run, hit, yell and laugh, but your needs are not met. You attempt to find your own outlet: rough squeezes, hits on our arms, pulling on teachers, and tackling your peers. But, you are misunderstood and disciplined and eventually expelled from school. Alone, at home, we sit together, we work together, we learn together. Writing today’s vocabulary words in your notebook while sitting at the kitchen table, you pause to look up at me with appreciative eyes. I hear what your eyes are telling me. My own eyes swell up with tears, “I love you too, baby. Someday you can go back to school and be with your friends.” My heart breaks that only I can hear your voice: the sorrow, missing interaction, friends, and being a child on the playground, running, chasing, laughing, and feeling free. Tirelessly, I fight to be heard. You are a loving and beautiful boy, and someday others will understand your strong squeezes for the communication that it is, and not misunderstand it as misbehavior. They are your outlet, your way of venting….your brother tackles on the football field, you tackle us on the couch. The neighborhood kids run through the streets, ride on their bicycles, and whiz by on scooters in front of our house, in front of your window. They yell and scream, and they fight and misunderstand each other. This is growth and accepted as a part of adolescence. Yet, it leaves you wondering. You wonder why when you make loud sounds that strangers make, even at school, you are told to “shhh.” You wonder why when you protest as other children so often do, your mom is called to bring you home. Together we wonder when the world will see that you are just a child behaving like a child. I see you for who you are. I love you for who you are. And I admire you for never giving up. For the way you keep smiling, laughing and loving. Take pride in who you are my sweet child, for you are a genuine soul. I love you and I can hear you speaking to my heart. 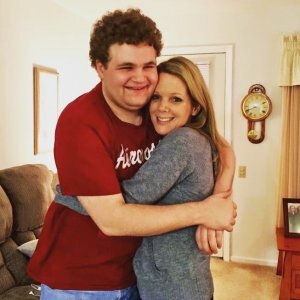 Colleen Nagle Tryner is the parent of a 19-year-old son with nonverbal autism. She resides in Illinois, were she diligently researches communication and how to teach her son skills including self-help, academics, independent life skills and ASL to name a few. Together, Colleen and her son spend their days together, learning from each other. Colleen is continuing her own education having returned to college last year. Learning American Sign Language, she has been successful in teaching her son beginner ASL. She began homeschooling her son when he was 12 years old. She has documented her journey in numerous articles shared among the community of parents of disabled children, lectured at colleges to courses full of future doctors, teachers, therapists, and psychologists. She has a large following of her personal journey across social media sites, referred to as: Autism Sign Language. True,so true, Autistic children are so misunderstood. Tiring & wrong to think of these kid’s as having behavior problems, instead of realizing the truth. They are just trying to communicate in the only way they are able too… Gentleness, understanding, are needed for our kids- Thank you. Thank you for this article, it’s warm, it’s informative and it’s very insightful.